One of the perks of being the PNW Beer Chick is that I occasionally get a chance to sample upcoming or newly released beers. Last week I was given a sample of three of Canada’s very own Alexander Keith’s Nova Scotia Style beers and the opportunity to join in a virtual tasting. It was loads of fun sampling the brews while chatting live via webcam with the brewmaster himself; Graham Kendall. Alexander Keith emigrated from his native Scotland to Nova Scotia (“New Scotland”) in 1817. In 1820, he started up Keith’s Brewery at the tender age of 25. The brewery has been running continuously ever since making Alexander Keith’s one of the oldest breweries in North America. 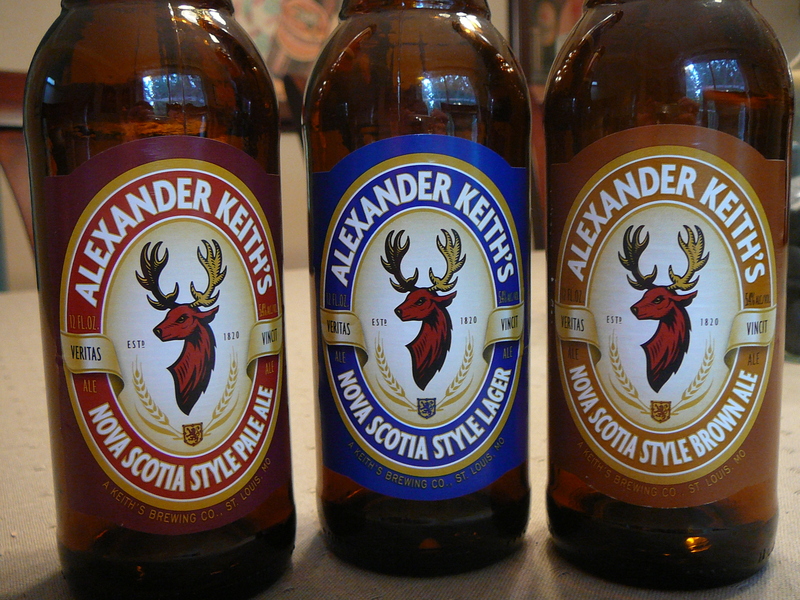 Just recently Anheuser-Busch began brewing three of Alexander Keith’s beers; the Nova Scotia Style Lager, Nova Scotia Style Pale Ale, and the Nova Scotia Brown Ale, while Alexander Keith’s Canadian beers will continue to be brewed in Nova Scotia. Alexander Keith’s is now available in 22 states in the United States. Nova Scotia Style Brown Ale (5.4% ABV): Dark brown color and strong honey nose. This brown beauty is full-bodied but not too heavy. The Brown ale is sweeter than I expected with caramel notes and a slight toasty finish. Not bad. Nova Scotia Style Pale Ale (5.4% ABV): I was a bit disappointed with this beer. I enjoy hoppier pale ales and this one was just too weak for the PNW palate. There were a few floral notes and a soft wheat flavor, but this pale ale resembled a Budweiser more than a pale ale. Bummer. Nova Scotia Style Lager (5.4% ABV): My favorite of the three was the lager. This beer is dark honey in color and has notes of caramel and wheat. Crisp and clean this lager is a great spring/summer beer. While I enjoyed the virtual tasting, I have to be honest and say that these beers are good, but I don’t think they will appeal to the PNW beer enthusiast. I’m a sucker for tradition and legacy but I’m afraid Anheuser-Busch is producing something that resembles a product they already brew. I hope Alexander Keith’s continues their long legacy in Canada and wish them the very best of luck in the U.S.! I hate when mass producers ruin micro brews like this. Why do they have to screw with an already good thing?